It's no surprise I live in Chicago, a concrete mecca of skyscrapers, traffic and stress. There are so many times in my life where city life just doesn't work for me. I look back to my childhood camping with my Girl Scout troop and I end up with the desire to head out to the wilderness for a weekend. But wilderness and beautiful hiking trails aren't that common near Chicago, or much of Illinois. 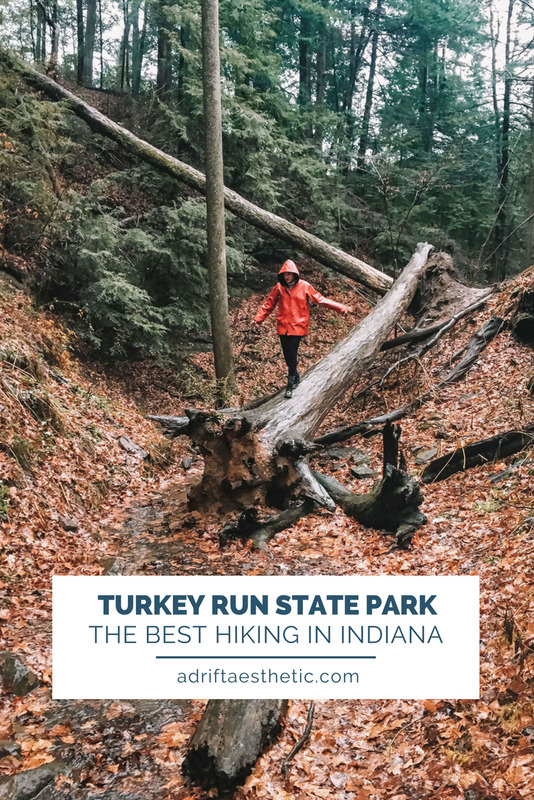 It was while planning one of these "get out of the city" missions that I learned about Turkey Run State Park, over 2,300 acres of hiking trails, waterfalls and awesome nature along Sugar Creek, a 3 hour drive from Chicago and just north of Terre Haute, Indiana. I love national parks but here in the Midwest, state parks are our best option. However, hiking can get pretty monotonous in our nearby parks since we don't have sprawling mountain ranges or exotic landscapes to explore. That's why there was one thing in particular that really caught my eye while googling Turkey Run: hiking on trails of ladders. I'm a huge fan of hiking but when a state park mixes it up a bit and throws in something like wood ladders leading you down the sides of cliffs and giving you access to different levels of waterfalls, I'm all about it. The ladders proved to be a fun addition to a strenuous hike that added a bit of risk to our rainy day. The trails in Turkey Run State Park aren't for the casual hiker; you're going to get a workout. Only a 1/2 mile of trail is labeled as "easy". The other 10 trails range from "moderate" to "rugged" to "very rugged". If you want to climb those ladders, you want the very rugged trail #3. This 1.7 trek trail will take you through a series of ladders, have you hiking along water (wear waterproof boots! ), and will take you in and out of crevasses and canyons in the sandstone cliffs carved by glaciers 100's of millions of years ago. You'll also be able to see some of the more memorable natural sites of the park on trail #3 including the Punch Bowl and the Ice Box and you'll have the chance to burn even more calories making your way through the "140 Steps". All of the trails of Turkey Run State Park start once you cross the suspension bridge over Sugar Creek. Crossing this bridge separates you from the busy parking lot, park office and hotel on site and leads you into a beautifully quiet yet stunning landscape made for exploring. It's easy to spend a whole day hiking Turkey Run, with each trail easily leading into another and all eventually taking you back to the suspension bridge to get your bearings. 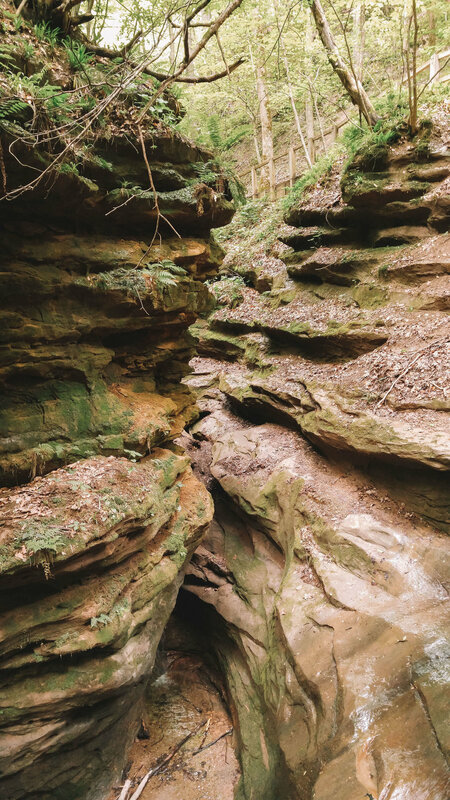 Turkey Run State Park is open year-round and provides varying hiking experiences depending on the season. Whether you see the lush greenery of the summer, the colors changing in the fall, or you're hiking in heavy rain like my first time there, you're still going to have an amazing time. It's a park that is easily revisited and a perfect temporary escape from Midwest life.